Tetovo is a city in the north-western part of Macedonia, lying at the foothills of the Sar Planina (Mountain). The city is located in the upper part of the productive Polog valley, on an altitude of 468 meters above the sea level. Tetovo is located on 42 km from the capital Skopje and from the nearby city Gostivar, just 24 km. 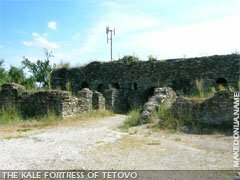 Tetovo was founded, as an orthodox settlement, around the Sveta Bogorodica church in the 14th century. The oldest settlement in Tetovo is the region around the Sveta Bogorodica Orthodox church. The modern Tetovo grew from this small medieval Orthodox Slavic settlement of Htetovo with the building and construction of houses around the Orthodox Church. At the end of the 14th century, entire Macedonia fell under Ottoman-Turkish rule. The Muslim Turks began settling and colonizing Macedonia with Turkish settlers. The Ottoman Turks began the Turkification and Islamization of Macedonia (they built mosques, baths, turkish markets). The Ottoman Turks altered the Orthodox Slavic nature of Tetovo, which in Turkish was renamed Kalkandelen. The Ottoman Turks began settling the level lowlands of Tetovo. Hadzi Kalfa in the 17th century noted in his writings that Kalkandele, the Turkish name for Tetovo, that the city was expanding. In the 19th century, the population of Tetovo began to increase with settlement from the surrounding villages. The French traveler Ami Bue noted that the population was approximately 4,000-5,000 persons in the year of 1900. Since the division of Macedonia by the Balkan wars (1912-1913) Tetovo fell under Serbian rule. During the Second World War, Tetovo was under control of the fascist - Italy and Albania. The Communistic Party of Macedonia was formed on March 19th 1943 in Tetovo. Today Tetovo is a modern city with around 65,000 citizens. Around 50%-55% are ethnic Albanians, while the rest 50%-45% are Macedonians, Turks and Gypsies. The percentage of ethnic Albanians is up to 70% in the surrounding villages of Tetovo. Tetovo is separated on two sides, by the river Pena, which flows from the Sar Planina. Tetovo has several settlements, as Koltuk, Baltepe, Drenovec 1, Drenovec 2 (illegal settlement), Dva Bresta, Sveti Nikola, Potok, Dol, Banja, Gamgan, Saat, Ajducko Maalo and many others where Tetovo citizens live. Tetovo is the seat of the well known Teteks textile and clothing industry, while important industrial factories in the Tetovo region are Jugohrom - Jegunovce, (a major plant for the production of chromium and Ferro-silicon), IGM - Vratnica & Renova - Neprosteno (factories for pave elements). The comparative advantages of the Polog valley have been well used for the development of agriculture, especially market-gardening and fruit growing. 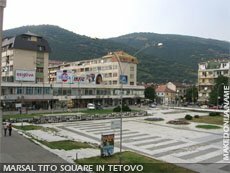 In recent years, Tetovo has become a center of private businesses and trade. The comparative advantages of the Polog valley have been well used for the development of agriculture, especially market-gardening and fruit growing. The (South Eastern European) SEE University is settled in Tetovo, by the local road Tetovo - Gostivar. More recently, Tetovo has become a center of private businesses and trade. Countless small shops have been opened where one can buy almost everything, "from a needle to a locomotive". The well known ski resort of Popova Sapka lies above Tetovo in the Sar Mountains. It is linked to the city by an asphalt road and a cable railway (out of order-vandalized in 2001 by Albanian terrorists). Some of the mosques in Tetovo are old and date back to the 17th century, but there are some even older. 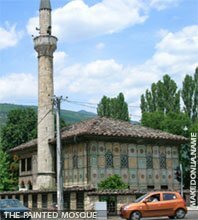 Among them is the most beautiful mosque in Macedonia, the Painted Mosque (Sarena Dzamija) built in 1459 by the Ottoman Turks. 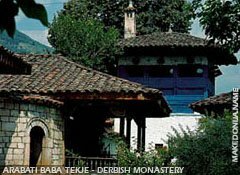 In the vicinity of Tetovo there is the Arabati Baba Tekje dervish monastery. 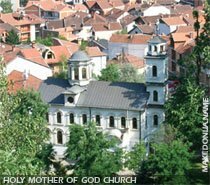 There are the churches of Saint Nikola and to one dedicated to the Holy Mother of God. The Monastery of Lesok with the churches of St. Atanasius and of the Holy Virgin, from the 14th century, is situated near Tetovo. In honor of the educator Kiril Pejcinovic, who is buried in its yard, this monastery hosts an International Meeting of Literary Translators. This church was bombed by the Albanian terrorists in August, 2001, but it has been rebuilt soon. Tetovo is also host to the Festival of Macedonian Choirs.